1-800 DRYCARPET® Carpet Cleaning Montgomery Birmingham, Huntsville, Tuscaloosa, Hoover, Dothan, Decatur, Gadsden, Auburn. • A thorough and professional cleaning process to rid your carpet of deep-down soil. • Experienced Agents from 1-800 DRYCARPET who use safe methods to treat and clean your carpet. • 1-800 DRYCARPET™ innovation and quality. about carpet cleaning. Read what people are saying about 1-800 DRYCARPET here. To speak with me or to schedule give me a call. Connect LIVE to Calendar - Schedule Online or call 1-800-379-2277. The Leader in Authentic Dry, Organic Carpet Cleaning. 1-800 DRYCARPET® Carpet Cleaning employs physical contact instead of water pressure. Swedry® Carpet Cleaning provides a more thorough cleaning in addition to a carpet that stays clean longer since there is no soap and water left to dry in carpet. Swedry® Carpet Cleaning machines have dual counter rotating brushes that move vertically through carpet pile, lifting as they clean. Swedry® absorbs, traps and removes soil, leaving carpet clean, dry and ready to use immediately! 1. Vacuuming: We vacuum before getting started. Vacuuming is a very important part of our system. 2. Stain and spot removal: We use our own non-detergent product. 3. Pre cleaning: Swedry® ACCELERATOR Pre-Mist (liquid) is applied to soiled areas. 4. Swedry® Carpet Cleaner: Is distributed on the carpet. Swedry® is environmentally safe and is biodegradable. 5. Swedry® Carpet Cleaning: Swedry® Carpet Cleaning machines have dual counter rotating brushes that move vertically through carpet pile, lifting as they clean. Swedry® absorbs, traps and removes soil, leaving carpet clean, dry and ready to use immediately! Our system employs physical contact vs. water saturation. 6. Vacuuming/Extraction: This is the final step. Residential appointments usually take 1.5 to 3.5 hours. Items that we move: Couches, oversized chairs, coffee tables and dinning room table chairs. Items that we don't move: Entertainment consoles, electronics, china hutches, beds, dressers and pianos. Our rates are based on your exposed and cleanable area. For the safety of your property we do not move heavy, electronic or breakable items. Our exclusive authentic dry carpet cleaning system will not flush-out or extract carpet stain resistant materials. Swedry® DRYCARPET™ Carpet Cleaner is environmentally safe! We're the only company in the world that specializes in cleaning carpet without water pressure and the use of soap and detergents. Our dry carpet cleaning system will indeed clean your Berber carpet and will provide excellent results BUT our system may not remove all the detergent residue that can be left behind by wet carpet cleaning methods. Zero Residue Carpet Cleaning Since 1992. 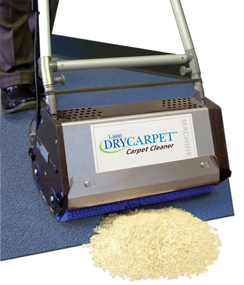 All rights reserved ©1997 - 2007 1-800 DRYCARPET Systems, Inc.